1,064 women received prenatal care and delivered at the Medical University of South Carolina (MUSC) between September 2015 and December 2016. During this time frame, MUSC implemented GrassrootsHealth’s Protect Our Children NOW! program which supplies institutions everything they need to incorporate vitamin D into the standard of care for pregnant women. What exactly is Protect Our Children NOW!? The main point of the program is to test vitamin D levels for all pregnant women at their first prenatal visit, ideally 12-14 weeks gestation, and to give each woman education, free supplements and encouragement to get their vitamin D levels above 40 ng/ml (100 nmol/L) as soon as possible with their pregnancy. To aid this goal, every pregnant woman should have a follow-up vitamin D screening around 22-28 weeks gestation. At this prenatal visit, or the following, the doctor would continue to educate the patient on the importance of vitamin D levels above 40 ng/ml (100 nmol/L). Finally, a third vitamin D measurement as close to delivery as possible is taken and information about the delivery and health statistics on the baby are recorded. One of the key components of this project is education. Education is needed for the many doctors and nurses who are implementing the program, and education for the patients is also critical to give them the motivation to take daily supplements. Vitamin D levels above 40 ng/ml were safe for all 1,064 women. No adverse effects were reported. 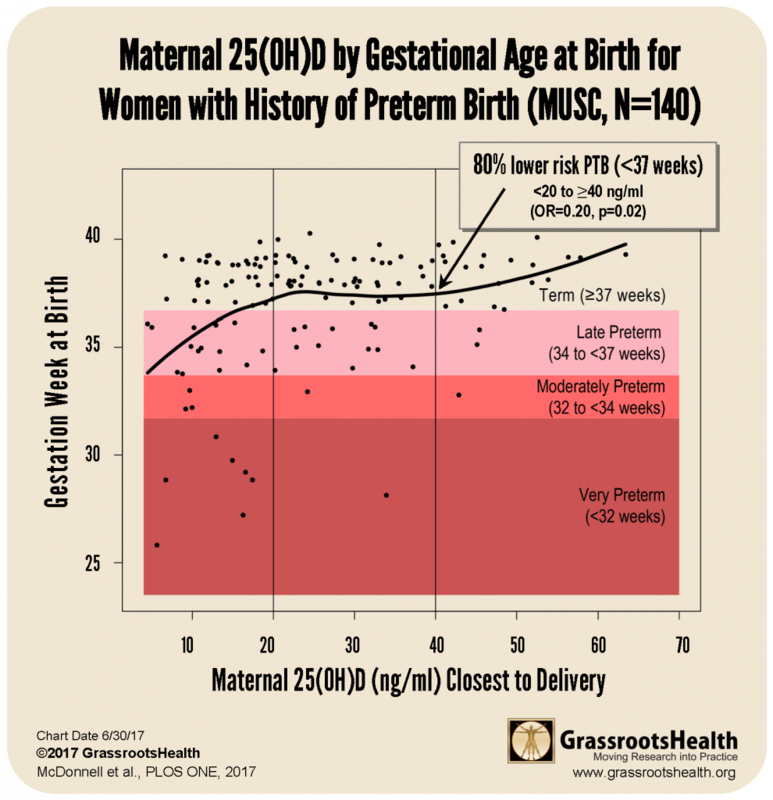 Overall, women who got their vitamin D level above 40 ng/ml (100 nmol/L) by the time of delivery had a 62% lower risk of preterm birth as compared to women with levels under 20 ng/ml (50 nmol/L). (The average vitamin D level in the US is 24 ng/ml). 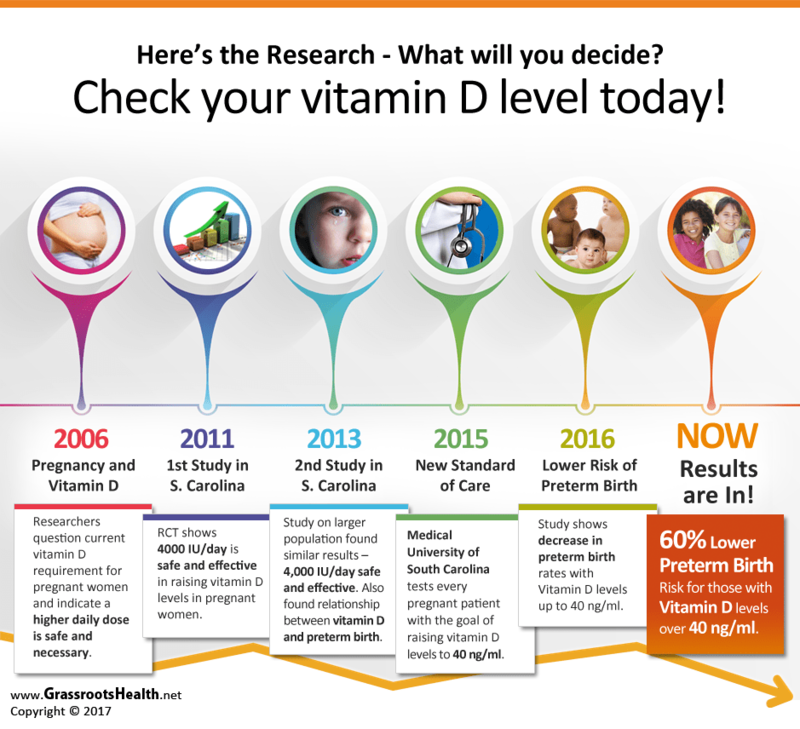 How do these results compare to past studies on vitamin D and pregnancy? They are very, very similar. This graph plots the data from this nutrient trial with the data from the Hollis and Wagner randomized controlled trial (reference 12). Notice the similarities in lines. 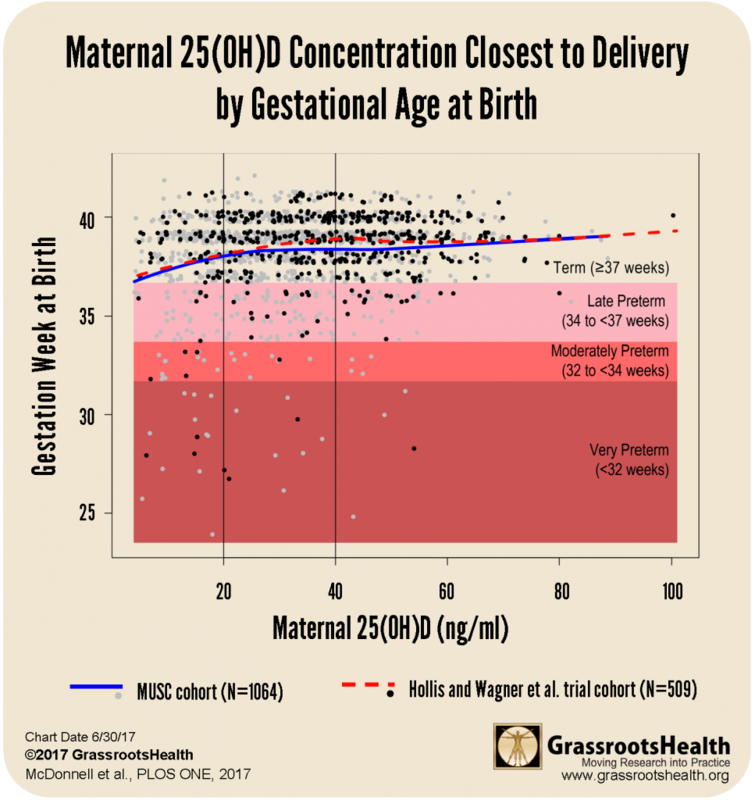 As vitamin D levels rise, so does gestational age, until it starts flattening out after 40 ng/ml (100 nmol/L). Were the results different by ethnicity? Yes! There is a distinct racial disparity in preterm birth. This might make sense if vitamin D is a key nutrient preventing preterm birth. Why? Because people with darker skin tend to have lower vitamin D levels. It typically takes a dark African American 2.5 times the amount of time in the sun to make the same amount of vitamin D as a light-skinned person of European descent, yet people are not likely to spend that much more time in the sun, resulting in generally lower vitamin D levels. Could vitamin D be the equalizer to racial disparity in preterm birth? 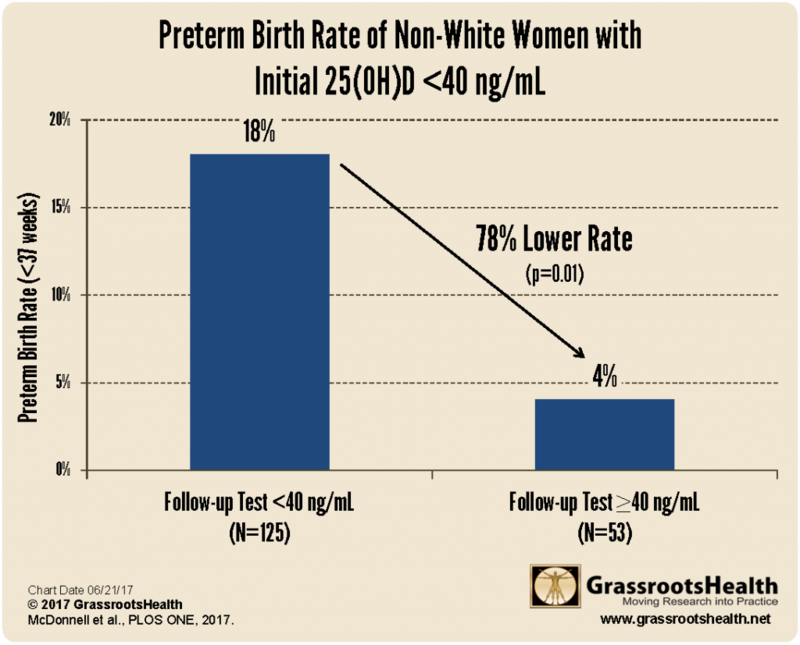 Here is what this study found – that non-white women were able to lower their preterm birth rates by 78% by raising their vitamin D levels above 40 ng/ml (100 nmol/L). In this cohort, the preterm birth rate was 10% for white women, 15% among all non-white women, and 19% for African Americans. It is also important to note that these charts show the women who received at least 2 tests. Having a second test provided an opportunity for feedback to both the doctor and the patient on whether their vitamin D regimen was working and another chance at education. Did any other subgroups have significant differences? Yes! Women who had a previous preterm birth. In general, these women are much more likely to have another preterm birth. Of this group, those who raised their vitamin D levels above 40 ng/ml (100 nmol/L) were 80% less likely to have a preterm birth than those who had levels below 20 ng/ml. This chart plots the gestation age at birth for the 140 women with a history of a previous preterm birth. You can see the points in the first section. The vitamin D levels are between 0-20 ng/ml and the average gestational age is lower. The second section has higher vitamin D levels and also a longer average gestational age. The rightmost section has vitamin D levels above 40 ng/ml and the highest average gestational age. The research community will say we need more data. They always need more data. That is why it takes 30 years for research to become practice. But we now have a substantial amount of data that shows that vitamin D can reduce preterm birth, the #1 health condition of concern in obstetrics. If you are a woman who is pregnant or considering getting pregnant – measure your vitamin D levels now – you can join Protect Our Children NOW! as an individual. You can measure during your pregnancy, and receive information on how vitamin D is a critical part of having the healthiest pregnancy possible. If you are an OB – don’t wait for the Institute of Medicine to change the RDA or for ACOG to mandate that every OB test and give vitamin D education. You can change the world for your community right now. If you have some extra money – please consider donating. We are creating a fund to help more institutions start this program. If you are a representative of a medical institution – contact [email protected] We will help you implement Protect Our Children NOW! in your institution!